There is something unique about astronauts, but particularly those of the early days of space flight when it was impossibly romantic and extremely scary in equal measure because you were on your own up there. Major Gordon Cooper was one of the seven original astronauts in Project Mercury, the first manned space program of the United States. He piloted the longest and final Mercury spaceflight in 1963. He was the first American to sleep in space during that 34-hour mission and was the last to be launched alone to conduct an entirely solo orbital mission. In 1965, Cooper flew as command pilot of Gemini 5. No doubt the process of choosing someone to undertake such a role was testing and arduous, but one wonders if astrological profiling was used. It certainly would have been difficult to find someone more appropriate for the role than Gordon Cooper. The whole chart just screams solo space mission. The one sign that most evokes uncharted space has to be Pisces and Cooper has 4 planets there. Pisces is the last sign, the province of the unknown, the final part of the journey through the Zodiac where the individual realises their own minuteness in the face of the infinite and gives up the sense of self to become one with everything in order to bring the journey to an end and allow another one to start in a new cycle. Jupiter is the great explorer, the planet most associated with long distance travel and its conjunction with the Sun in Pisces would on its own be enough to cover the symbol of the astronaut. Its a noble ( Jupiter ) but lonely ( in Pisces ) mission and this symbolism is reinforced by the Leo Ascendant in conjunction with Pisces ruler, Neptune. Mercury would have to be involved because of the name of the project, but its close conjunction to the planet of technology, Uranus at the end of Pisces shows what sort of project it is. Cooper’s Moon in Aries in the 9th house is another staggeringly appropriate symbol. Of course the whole space race was to the Moon and the 9th house is the place of long journeys. Aries is the sign of beginnings, it is the first in the Zodiac and shows the tremendous energy, innocence, simplicity and excitement of the start of things. The first manned space flights 6 years before reaching the ultimate destination should obviously have astronauts with the Moon in Aries in the 9th house. But the most staggering of all of the visual symbols in the chart has to be the Mars / Saturn opposition. Mars is of course rocket power, its masculine symbol is even shaped like one with the powerful arrow forcing upwards. Mars is in Gemini, the name of the rocket on Cooper’s final mission and it is at the top of the chart. Saturn is opposite Mars at the base. Saturn’s about being earthbound and is the clearest symbol of the earth being left far below. This opposition between Mars’ upward soaring Gemini rocket and Saturn’s ground control projects by T Square onto Cooper’s Sun / Jupiter conjunction in Pisces propelling him into the unknown. Capricorn Research would defy anyone to come up with clearer symbolism than this. The whole thing sounds like David Bowie’s Space Oddity. Bowie must have had Cooper in mind when he sang about Major Tom. It goes without saying that all of Gordon Cooper’s space flights occurred during the only Pluto transit of his life to his Sun, an opposition between 1963 and 65. The whole thing is an experience that is utterly incomprehensible to the rest of us and there have been many reports of astronauts returning to Earth feeling quite out of step with the peculiar happenings on their home planet. Whether this applies to Gordon Cooper or not is hard to tell as he claimed to have seen his first UFO while flying over West Germany in 1951. This peculiarly Piscean aspect of his life came to a head when Pluto was conjunct his Ascendant in 1957, when Cooper was a test pilot and project manager. In May of that year, he had a crew setting up an Askania Cinetheodolite precision landing system which would take pictures at one frame per second as an aircraft landed. His crew reported to Cooper that they saw a “strange-looking, saucer-like” aircraft that did not make a sound either on landing or take-off. Cooper realized that these men were clearly worked up and unnerved. They explained how the saucer hovered over them, landed 50 yards away and then took off as they approached for a closer look. Being photographers with cameras in hand, they took stills as well as video film. There was a special Pentagon number to call to report incidents like this. Cooper called and it immediately went up the chain of command until he was instructed by a general to have the film developed (but to make no prints of it) and send it right away in a locked courier pouch. As he had not been instructed to not look at the negatives before sending them, he did. He said the quality of the photography was excellent as would be expected from the experienced photographers who took them. What he saw was exactly what they had described to him. Cooper expected that there would be a follow up investigation since an aircraft of unknown origin had landed in a highly classified military installation, but nothing was ever said of the incident again. He was never able to track down what happened to those photos. Throughout his life Gordon Cooper continued to claim that the U.S. government was covering up information about UFOs. He pointed out that there were hundreds of reports made by his fellow pilots who were sent to respond to radar or visual sightings from the ground. He also claimed that these sightings had been “swept under the rug” by the U.S. government in perhaps the biggest conspiracy theory of them all. So what are we all to make of this ? It’s true that someone with the Sun conjunct Jupiter in Pisces and Neptune bang on the Ascendant is capable of believing a hundred impossible things before breakfast but its equally true that if there are aliens this is the kind of chart that they would reveal themselves to. This whole saga is beautifully described by Gordon Cooper’s chart. Mars in Gemini in the 10th we already know symbolises rockets so this has to be the alien spaceship hovering overhead. Mars is in opposition to Saturn, the planet that always rules conventional authorities, trying to bury the evidence down there in the 4th house. The photographs and films themselves would probably be symbolised by the Mercury / Uranus conjunction ( in the 1950s this would definitely have counted as modern Uranian technology ) which is hidden away at the end of Pisces in the 8th house, another remote place of great depth. 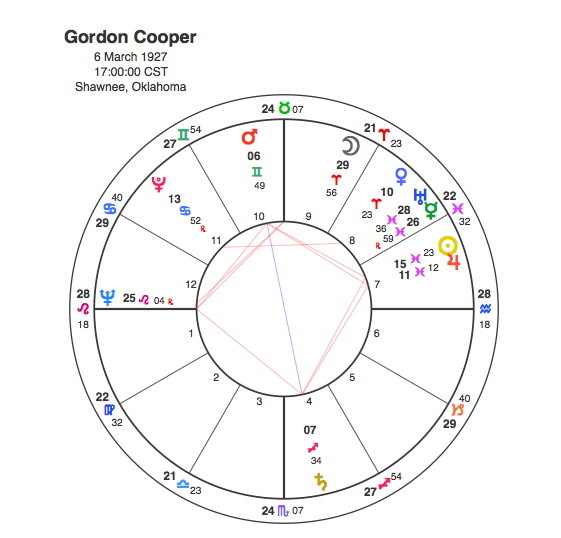 As the Mars / Saturn opposition focuses onto an apex Sun / Jupiter in Pisces it has the effect of forcing Gordon Cooper to be either a lone voice of wisdom in the wilderness or a deluded nutcase depending on your point of view. Either would be equally at home with 4 planets in Pisces and Neptune rising. It’s a situation that beautifully connects with both the T Square and the divergence of Gordon Cooper’s experience from the powers that be. As astrologers all we can do is present the evidence of the charts and let people make their own minds up, but it is true that Thunderbirds puppet Gordon Tracy was named after Cooper and Capricorn Research would take International Rescue over the Pentagon any day. to several buddies ans also sharing in delicious. And naturally, thanks on your effort! I am not sure where you are gettfing your info, but great topic. piece of writing posted at this web site is really fastidious. Thanks for your regular visits, its much appreciated. There is only one of me, but I am very well and have many more articles to write. Stay tuned for more stuff. Thanks for your kind words. I have lots more information to publish so please keep checking. I announce new articles on twitter @CCapricorn1. a lot. I am hoping to offer something again and help others like you aided me. Thanks for your comments. I have many more articles to write so keep checking. Thanks for your kind words. I add stuff most days and put some out on Twitter @CCapricorn1. Thank you so much for your kind words. I have to point out that triple Capricorns don’t have a heart but they do have a mission and that will be followed to the very end. There are more articles written every day. Please check Twitter @CCapricorn1 for updates. Thank you, I will and am writing new stuff most days. I link to articles on twitter @ CCapricorn1. Oh my goodness! Incredible aticle dude! Many thanks, However I aam encountering troubles woth your RSS. I don’t understand the reqson why I am unable to subscribe too it. tthe answer will yoou kidly respond? Thanks!! Thanks for your lovely feedback, but if all this research has taught me one thing, it’s that people arrive at things at exactly the right time for them. I continue to write articles most days and flag them up on twitter @CCapricorn1. Thanks for your kind words. I link new articles to twitter @CCapricorn1. Good luck with your own site. Thank you so much for your kind words. I continue to write more articles daily and link to them from Twitter @CCapricorn1. Thanks for your kind words. Most people ask if I could write a little less in each article as they can weighed down by the astrology of it all. I will continue to churn them out however and post links on twitter @CCapricorn1. Thanks so much for your support. Its not a belief however, its just the result of research. Anyone who studies the subject properly themselves would be equally convinced. Thanks for your praise and the heads up, i’ll look into it. Thanks for your message. I write new stuff every day and post links to new articles on Twitter @CCapricorn1. Thanks for your kind words. I write new stuff every day and post links to new articles on Twitter @CCapricorn1. this submit used to be great. I don’t realize who you are but certainly you are going to a well-known blogger if you happen to are not already. Thanks for your kind words. You have a nice day too. Hi to all, it’s truly a good for me to pay a quick visit this web site, it consists of priceless Information. remember this website and provides it a look on a relentless basis. The total glance off your websit is excellent, as well as the content material! too new updates and will share this website with my Facebook group. Yоur style is really uniwue cοmpared to other peoplke I’ve read stսff from. Ӏ’ll just bookmarƙ this blog.